Box for BlackBerry 10 includes being a core source within the File Manager, File Picker and Share Framework. Anywhere a user interacts with a file, they will have an opportunity to save or retrieve from their Box account. Because Box is an easily accessible source within BlackBerry 10, any application can read and write to a user’s Box account (i.e. you can easily launch a Word editor by touching a Word document within Box, very similar in concept to Box OneCloud). On September 21, 2018, we announced our intent to end support for BlackBerry10 and BlackBerry Playbook effective November 12, 2018. Get more information here. How is Box for BlackBerry 10 similar to Box’s other native mobile apps? What features are unique to Box for BlackBerry 10? Integration into BlackBerry Share Framework: Share your Box content with your BlackBerry 10 contacts your way – Twitter, email, BBM, etc. Box as a Source or Destination: Since Box is part of the BlackBerry 10 operating system, any application can use Box as a source or destination, without requiring a specifically built integration. Auto-launch an application simply by clicking on the file and the appropriate viewer will open. The Box app icon takes you to your settings for the integration. Once you log in you can access your files by selecting 'View My Files' or going directly to your 'File Manager' and selecting 'Box'. Once in your Box settings you can sync your photos/videos with Box and log out of your Box account. To log out or perform a manual sync, swipe down from the top of your screen to reveal that menu. The final option gives you the ability to toggle syncing over cellular data on/off. Once you select Box from your 'File Manager' or 'View My Files' from your Box settings, you will be taken to your Box files. Here you can move, sort, and create new files/folders. Because Box integrates directly with the BB10 'File Manager', the sharing options are native to BB10 and some of the Box specific sharing options like "shared links" and "collaboration" are not available. 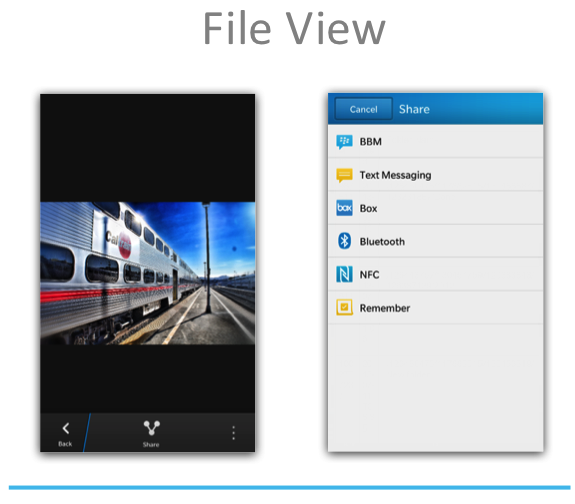 The "share menu" pictured on the right, shows the native BB10 options for sharing. From the file view you can share files to other applications or edit them if you have a compatible application on the device. What languages is Box for BlackBerry 10 available in? Does Box for BlackBerry 10 support SSO login? Box for BB10 does support SSO. To login using SSO, make sure you have the latest update to the app, enter your Box email address in the username field, and leave the password blank. Once you select authenticate you will be redirected to your company login page where you can login with your company credentials. Does Box for BlackBerry 10 work with BlackBerry Balance? BlackBerry 10 has a concept of BlackBerry Balance – there is a ‘personal perimeter’ and a ‘work perimeter’. It requires a BlackBerry Enterprise Server and creates a safe zone where enterprise applications and data can be stored. Why Aren't My Files Syncing? If you are having trouble syncing photos/videos through Box, the first thing to do is check your Box settings to make sure that you haven't disabled sync altogether or have syncing disabled on cellular data. How Can I Upload/Download Files to/from Box? Since Box is integrated at the system level, anytime you select the "share" or "move" option on the device, Box will show up as a directory that you can send/move files to. Likewise, when moving/sharing files from Box, just select the "Device" as the directory or appropriate application from the "sharing" menu. How Can I Create a Shared Link or Add Collaborators? Shared links and collaboration are not available on BB10. 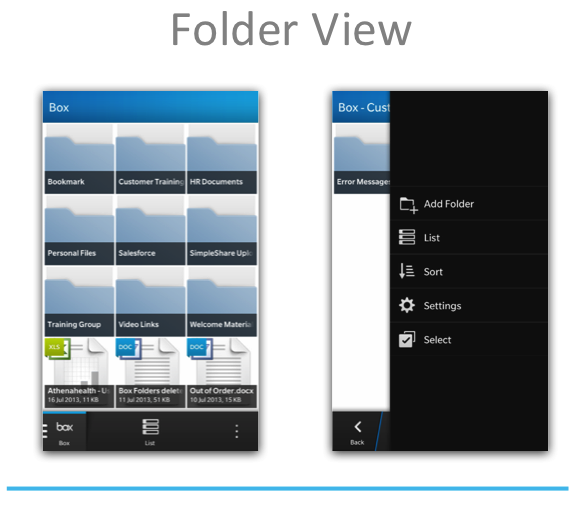 Since the Box functionality with BB10 is more an integration than a stand-alone Box app, the file management/sharing options are specific to BB10 and some Box-specific functionality may be missing. Why Aren't Our Admin Mobile Security Settings Applied to BB10? Since the BB10 functionality is not a stand-alone Box app our admin security settings aren't able to be applied. This includes device pinning, the ability to set pass code lock, and restrict ability to download files to your device.